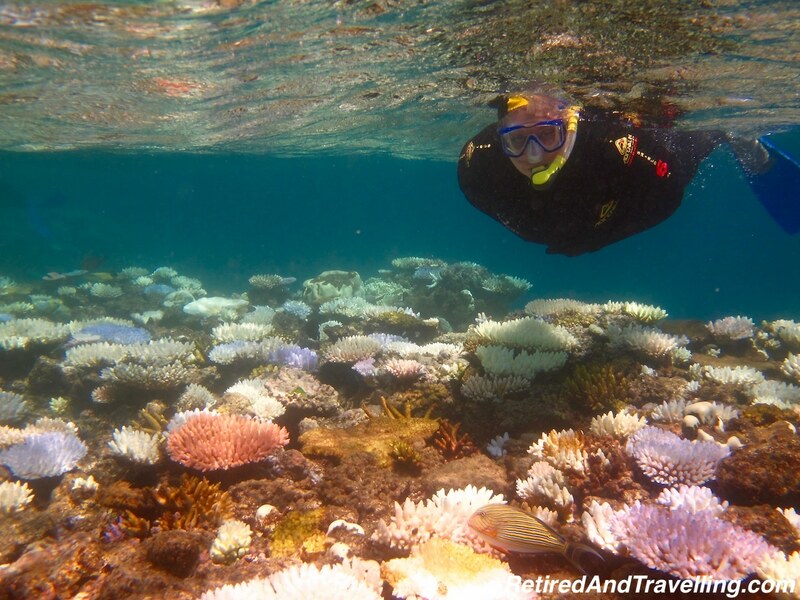 If you travel to Australia, one of the first things that people ask is “Did you snorkel or scuba the Great Barrier Reef?” Other than the Sydney Opera House, this may be the other thing that immediately comes to mind when you say “Australia”. 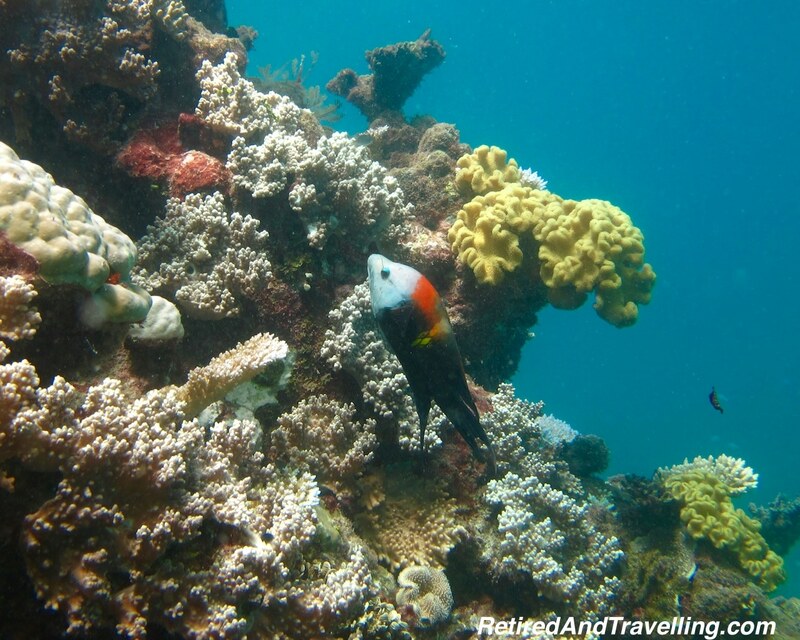 David had visited Australia many years before and not visited the Great Barrier Reef (“GBR”) and he was not missing it this time! 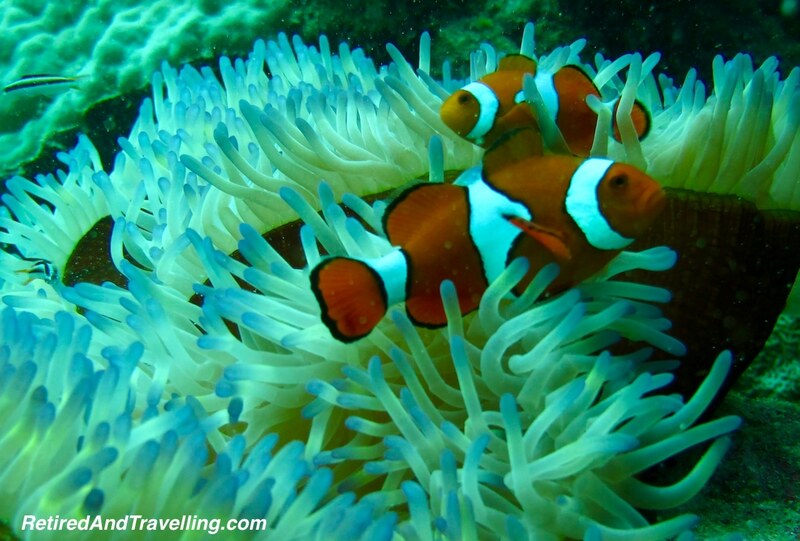 We certainly recommend that you see Australia from underwater at some point in your Australia visit! 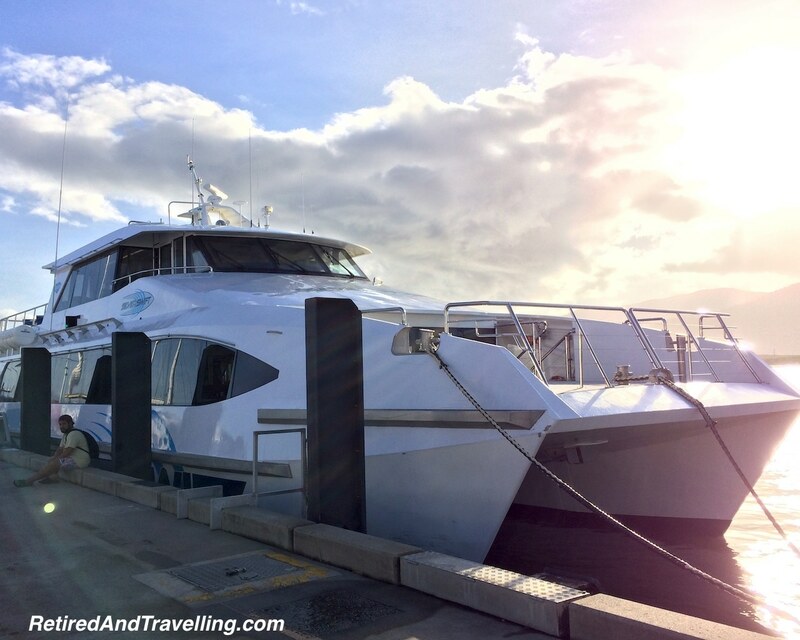 After spending a week in Sydney, we planned our stop in Cairns as the jumping off point to get to the reef. 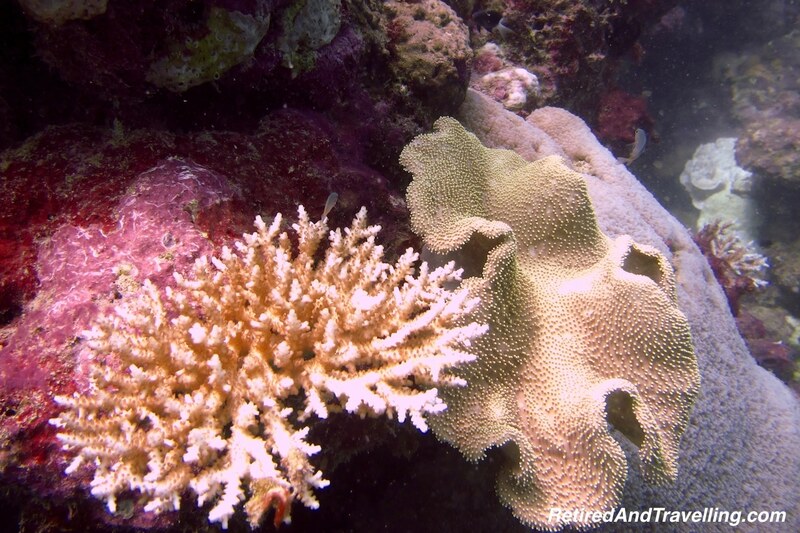 When we started planning for our SE Asia trip, we had originally considered doing a 3-4 day live-aboard dive boat to see the GBR. But once we put all our stops on the 6 week calendar, we needed to start squeezing a day here and there. 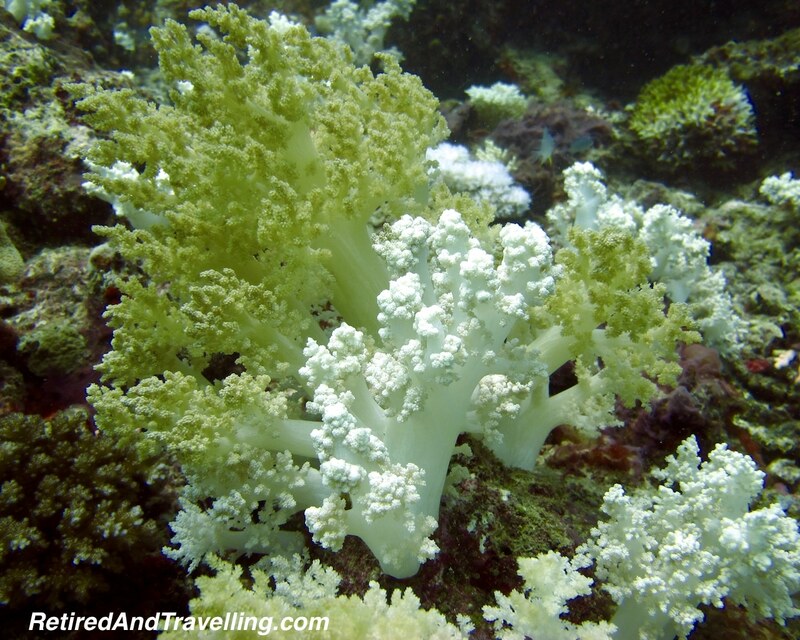 This left us with a little less time in Cairns, especially since we would need the recommended safety interval of 24 hours after diving before we could fly out. 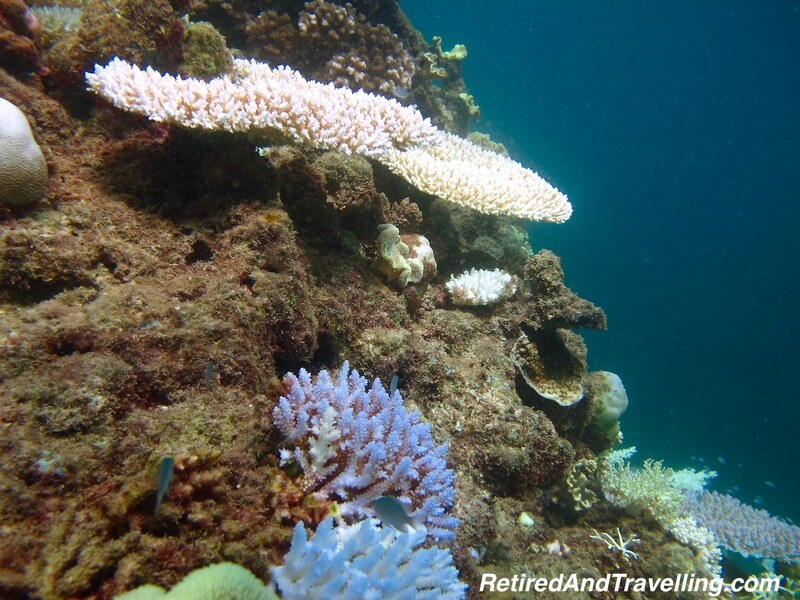 A diving live-aboard trip would be saved for our next trip to snorkel or scuba the Great Barrier Reef. 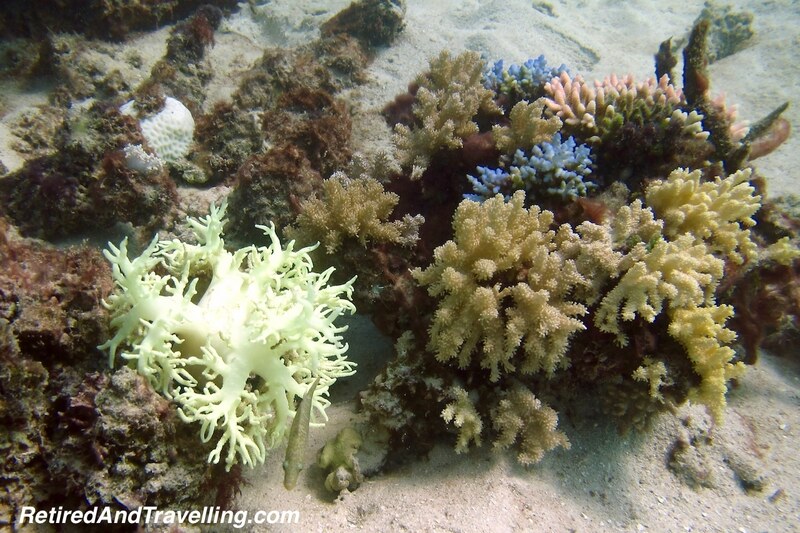 There are a lot of options to snorkel or scuba the Great Barrier Reef out of Cairns. 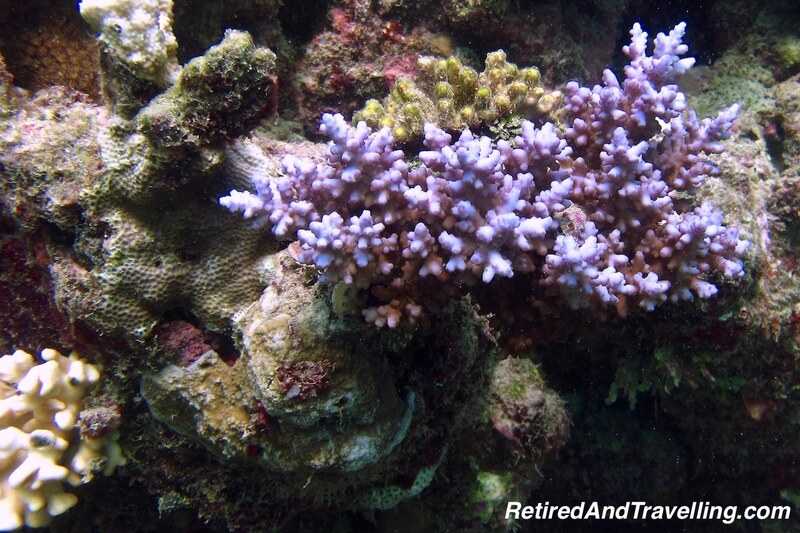 Most of them are shorter trips to portions of the reef much closer to shore. 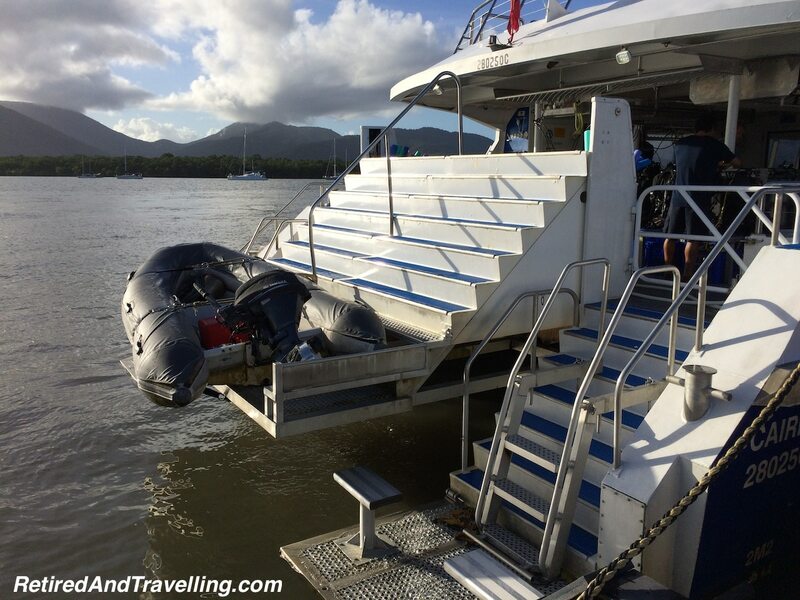 We wanted a bit more time and wanted less tourist-thronged sites so we picked a high speed boat tour with SilverSwift from Cairns. 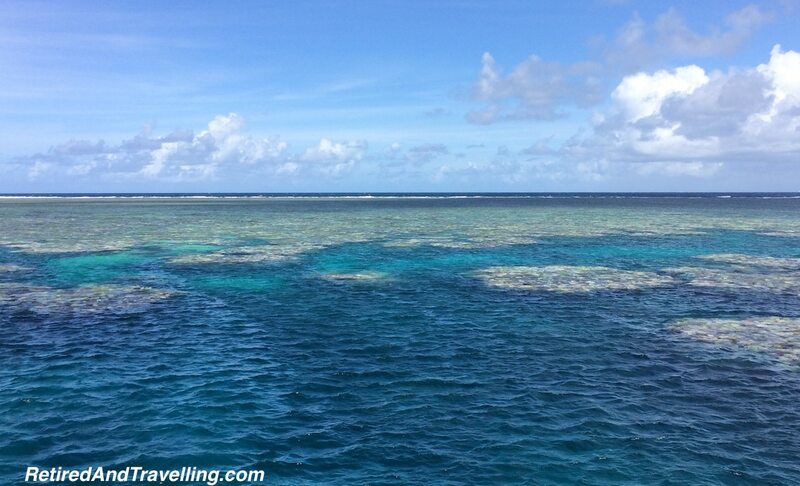 It was a 90 minute transit in and out but you got a much better sample of the GBR with 3 long stops as the boat was moved between different sites at Flynn Reef on the Outer Barrier reef area to snorkel or scuba the Great Barrier Reef. The boat was well outfitted with covered decks on the top and bottom to get you out of the sun after hours in the water. One of the biggest benefits of this bigger boat was the hydraulic platform at the back that lowered a set of broad stairs into the water for easy entry and exit from the water. For anyone who has ever tried to get back onboard a ladder in pitching seas, you would know how nice this much gentler access would be. 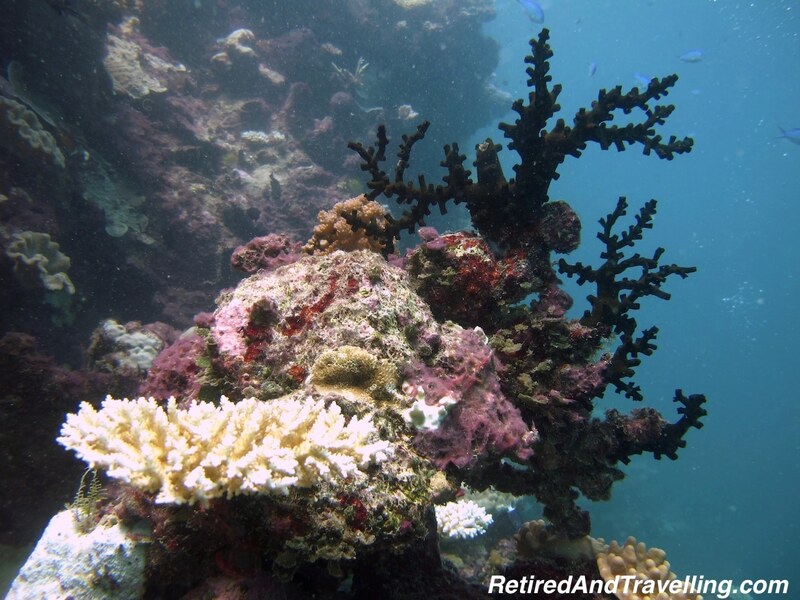 There was a fixed price for every person to snorkel or scuba the Great Barrier Reef that included the boat ride, snacks and a full lunch buffet. They provide full “stinger suits” – thin lycra suits with full arms, full legs, a hood and gloves – since it was still technically jellyfish (or “stinger”) season. While we had brought our own suits with us, we decided to keep ours dry and take the ones with hoods and gloves. 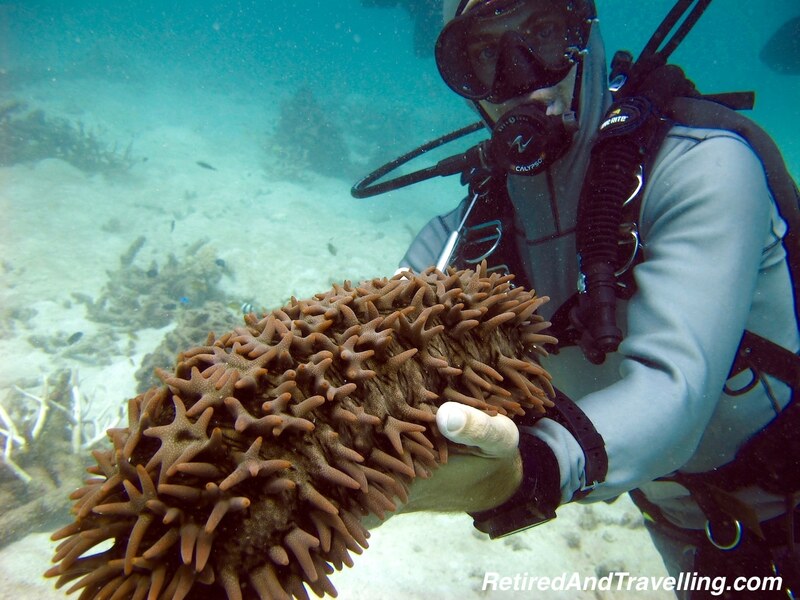 If you were diving, you could add on 1, 2 or 3 dives with gear rental. 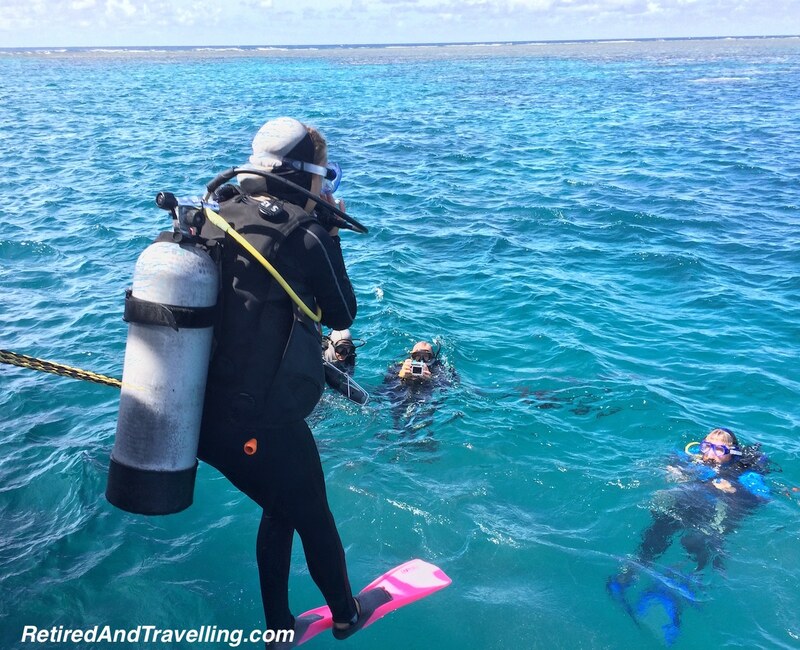 We had a full boat to snorkel or scuba the Great Barrier Reef the day we went out but the crew were well prepared to handle the numbers. Other than the line ups for lunch, the boat never seemed to be crowded despite the numbers on board. 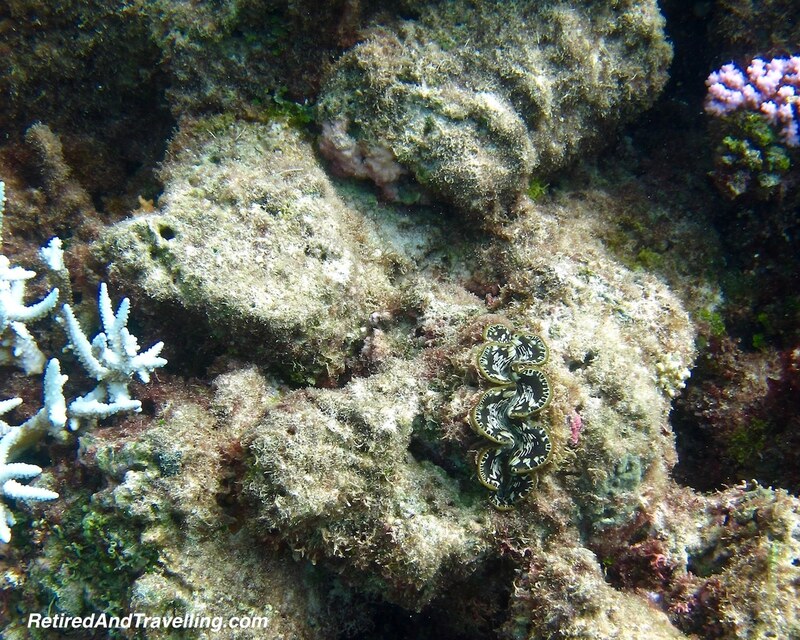 There was a large number of snorkelers, most in pairs or groups, with a wide range of snorkelling experience. 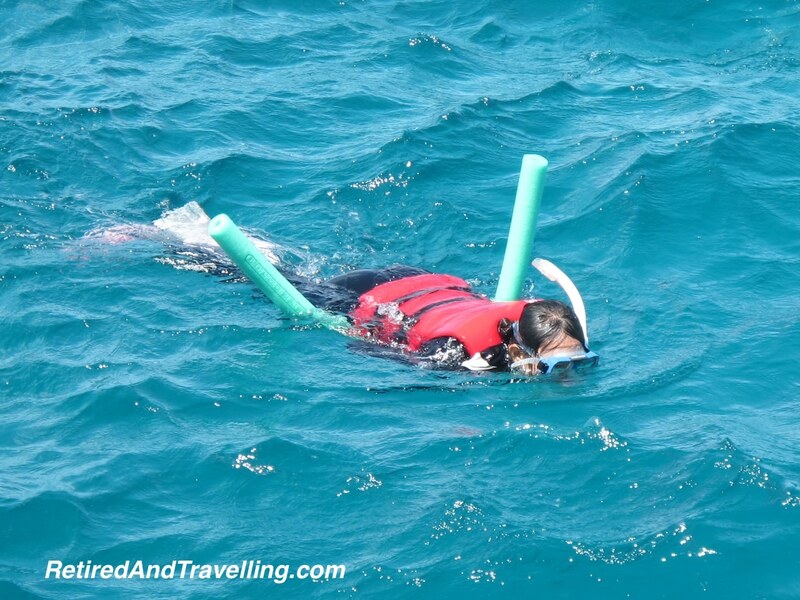 Most of the snorkelers were content to float on the surface, either letting their wetsuit keep them floating or by wearing a life jacket or holding a swim noodle – some both! 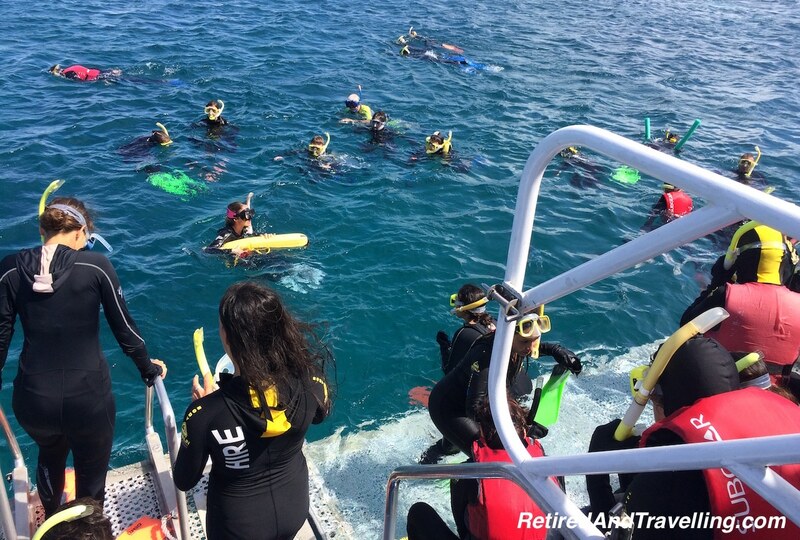 There were three groups of 6 divers – one group doing an introductory course with an instructor, a beginners group of certified divers and a very experienced group of divers (minimum of 100 dives). 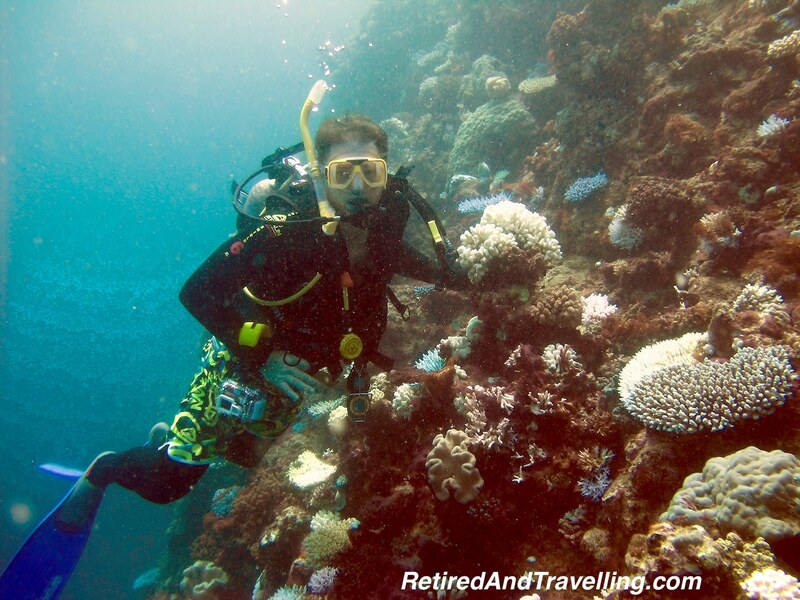 The divers generally got geared up and went into the water first when we arrived at a site. 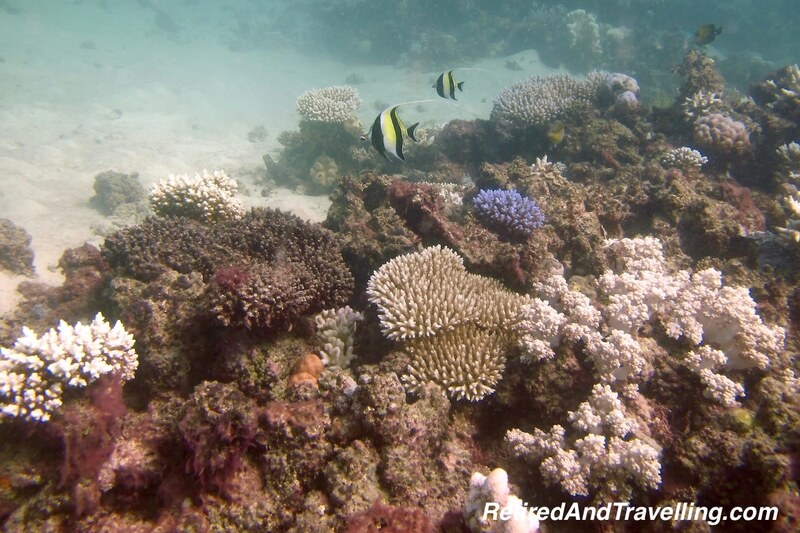 There was a profusion of cameras for those planning to snorkel or scuba the Great Barrier Reef. 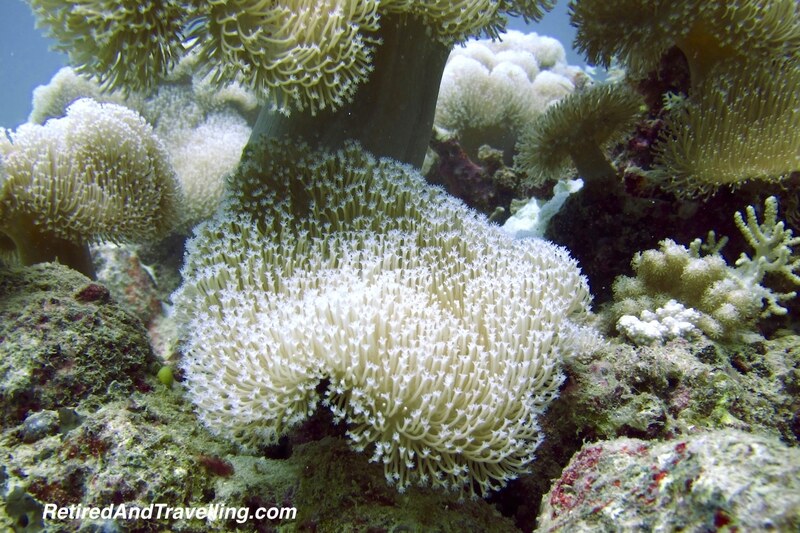 We had our Canon G11 camera in our underwater housing to capture all the details. My iPhone was in a wet bag good only for snorkeling. There were GoPros, rental cameras and disposable underwater cameras. The professional photographer for the boat seemed to be everywhere taking pics and displaying his images if you didn’t catch just that right picture that you wanted. 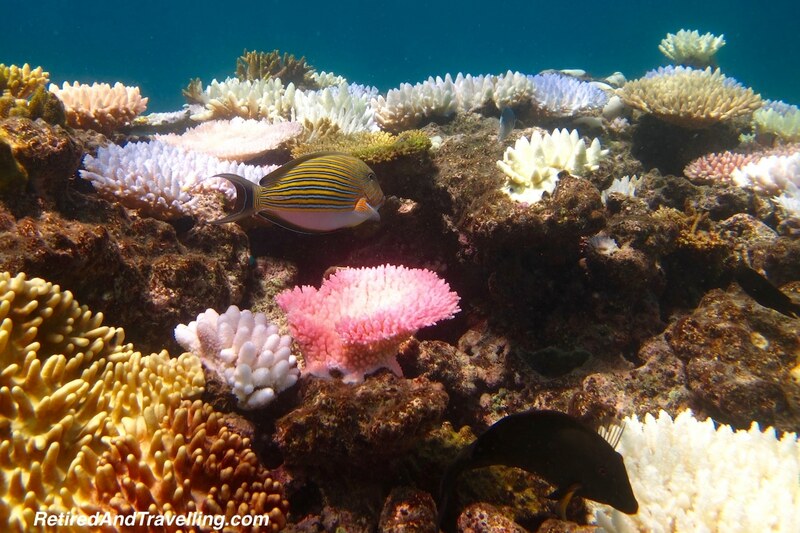 I had really wanted to dive the GBR but I picked up a lower respiratory tract infection a few days before we arrived in Cairns. It would be NO scuba for me this trip. But David went off with the divers to catch a different view of the three sites that we stopped at. 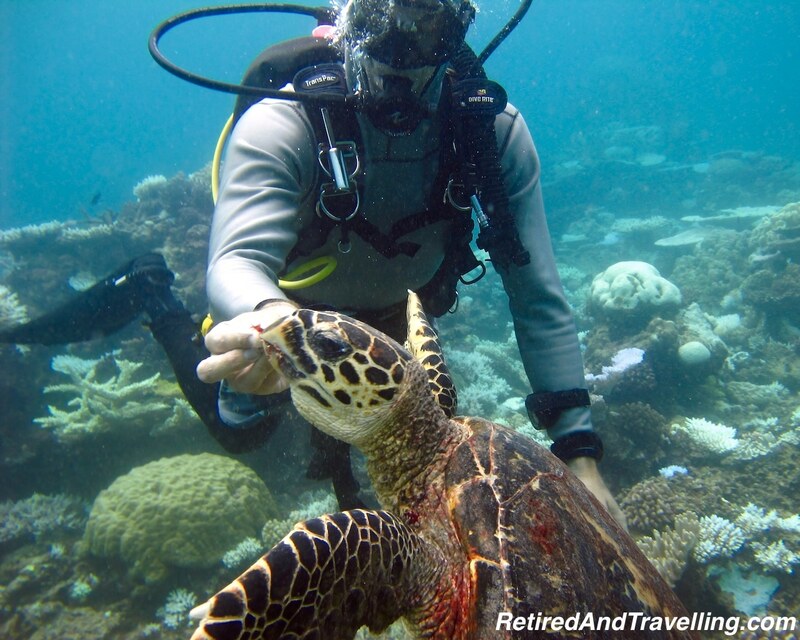 I must admit to missing the camaraderie of being with the experienced group of divers. When they pre-briefed for the dive, re-lived the things they saw and then formally debriefed, I had missed the experience. I could listen to David’s tales and re-live some of it through his photos, but it was interesting to see this tight little group from the outside whereas normally I would be in the heart of it. 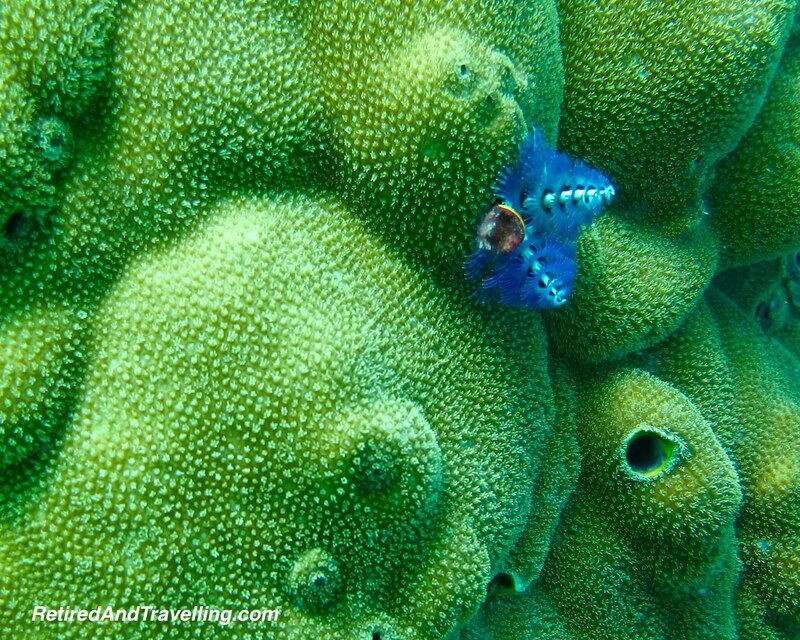 Since the boat had a good mix of divers and snorkelers, the reef sites we stopped at had great things to see for both groups. 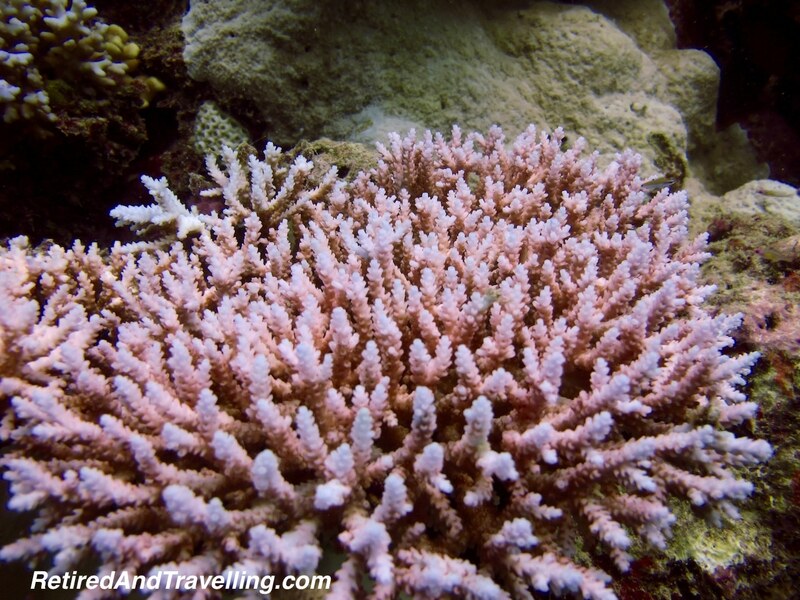 At each new stop, we would get a briefing on the spots to best snorkel or scuba the Great Barrier Reef in that area. We would be told where to swim and where not to swim if we had any hope of getting back to the boat un-rescued. We were given the signals to return to the boat (even if people ignored them more than once) and for well-being checks. 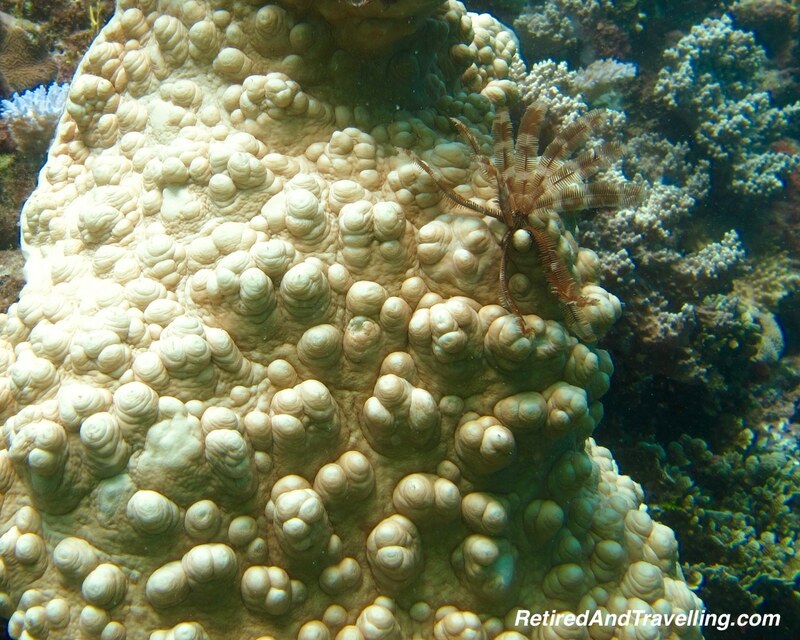 People were sternly told to be careful around the coral – no touching, no feet down but people were pretty bad at keeping their bodies well separated from the coral. 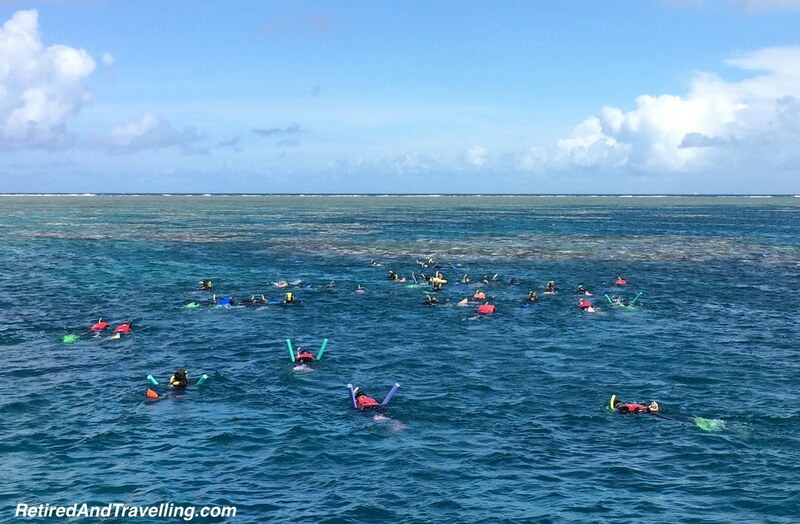 The snorkelers went off the back of the boat in small numbers, forming a swarm heading out to the reef. 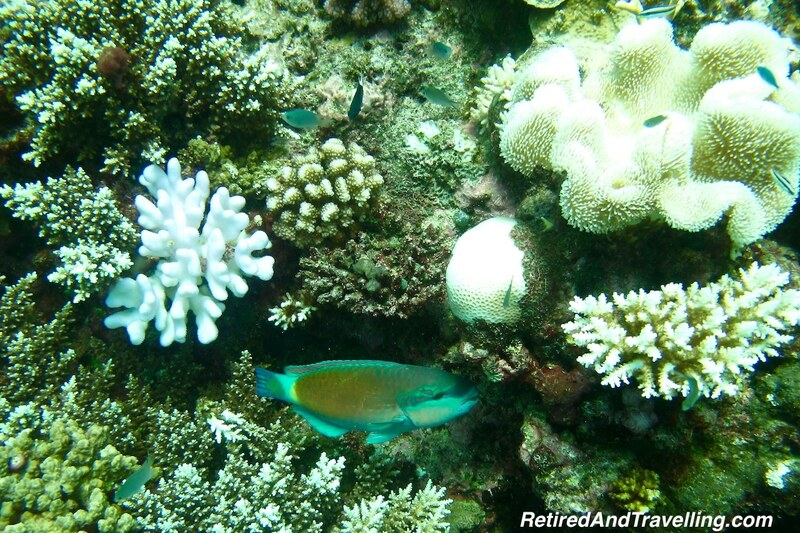 We tried to be early into the water to get over the reef before it got too crowded. 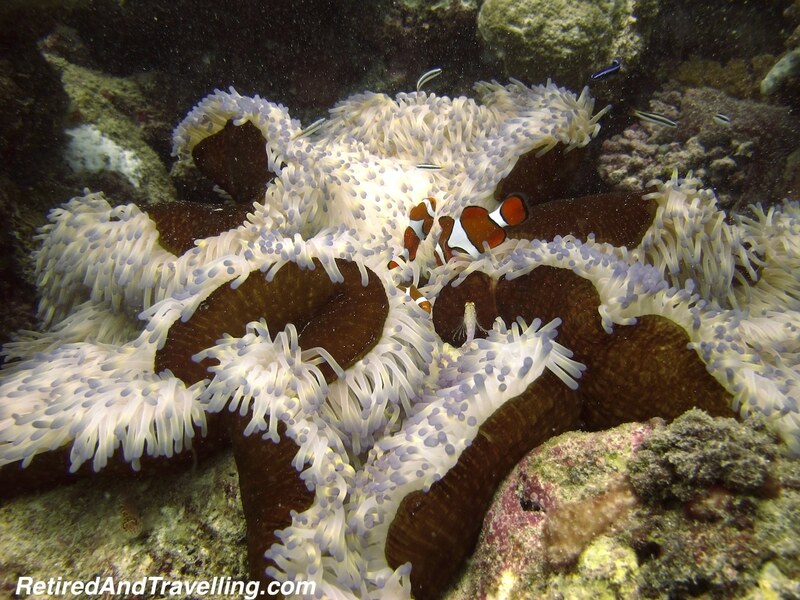 There were often several different spots within the area to see with different things to see – clams, unique coral and “Nemo” hiding in the anemone. 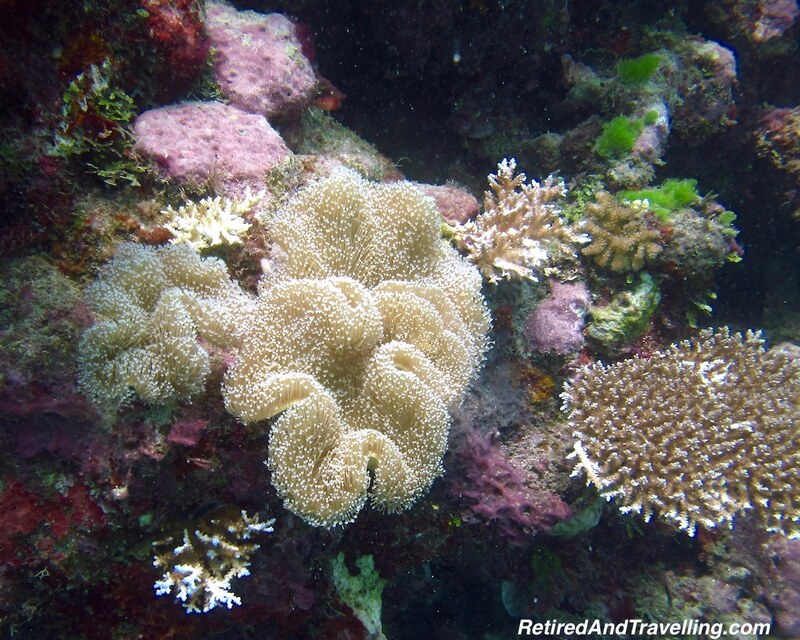 The tide went down as the day wore on, bringing the coral even closer to the surface and making the colours even more vivid. 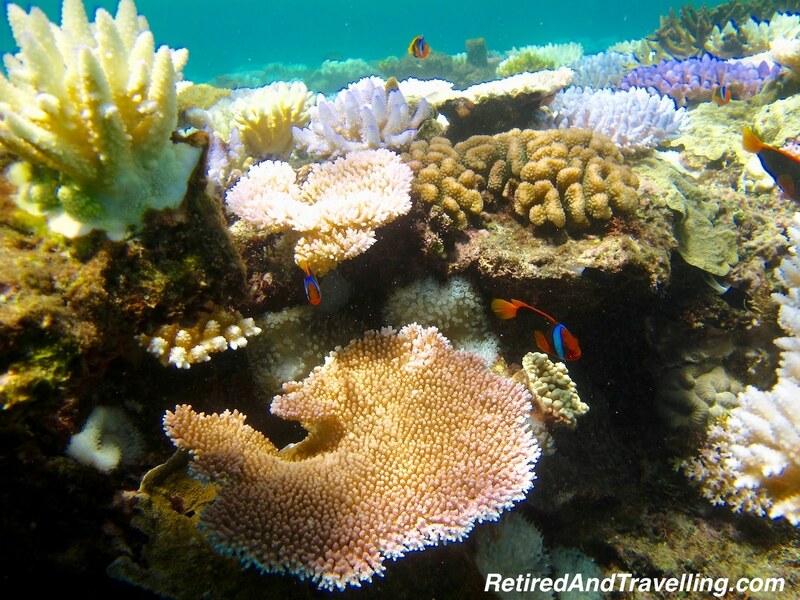 Whether you were in the water to snorkel or scuba the Great Barrier Reef, the shallow waters were great for all. The experienced group of divers were the first off the boat. Led by Simon, the group was off exploring for the maximum time at each stop. As is usual, the first dive was the deeper dive (about 60ft). David was disappointed in the relatively poor visibility (about 25 feet) even with a fairly sunny day. While they saw one turtle in the first dive, the giant turtles that had been promoted were nowhere to be found. 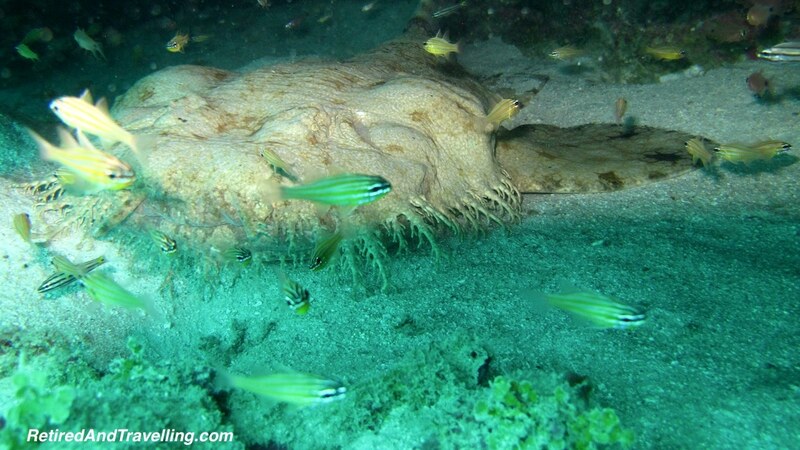 Someone said they saw sharks out in the open, but David’s photos showed only the very strange looking Wobbegong Shark. David snorkeled with me at the second location and then decided to go back in for a dive at the final more shallow location. 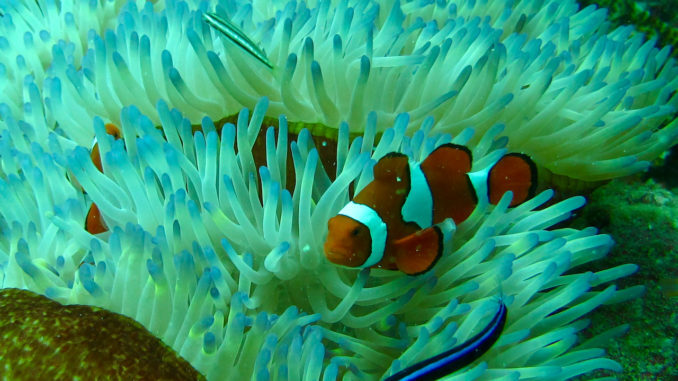 He had one objective – find Nemo and take lots of pics. 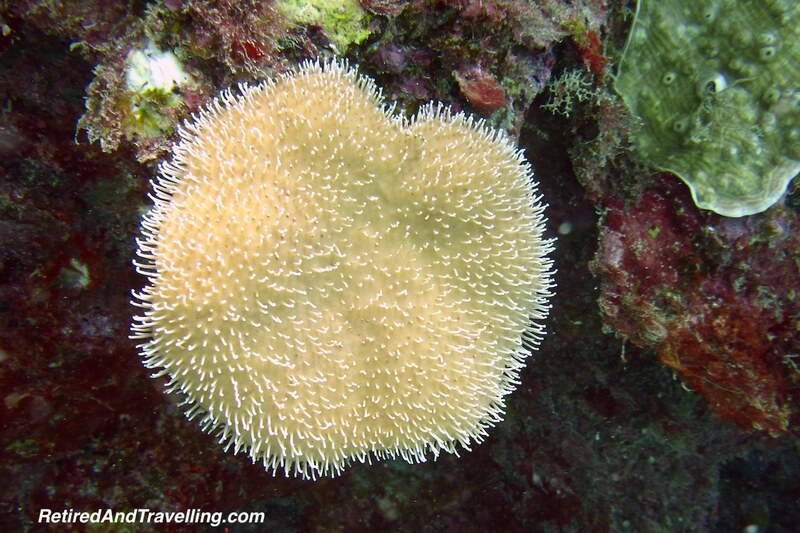 He was very successful in his primary objective and came back with lots of other interesting underwater pics. 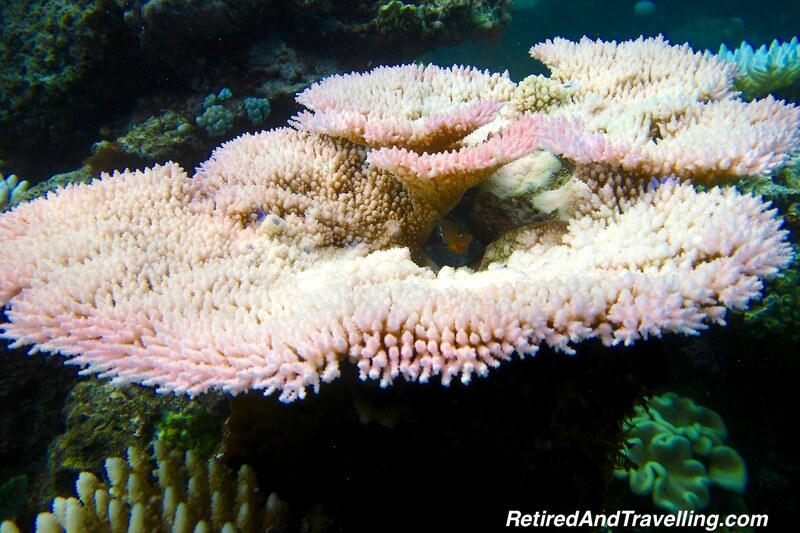 You should visit Cairns in Queensland to visit the Great Barrier Reef! 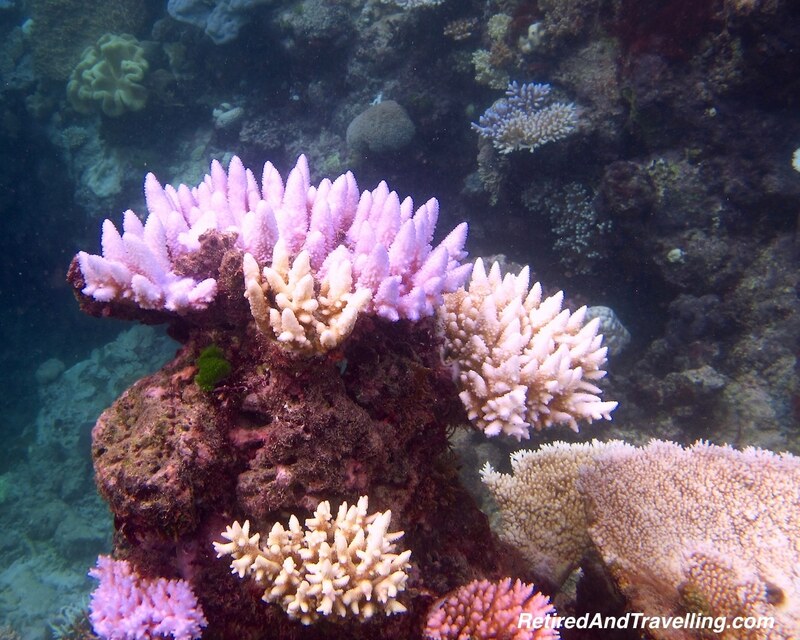 Whether you snorkel or scuba the Great Barrier Reef, don’t miss this adventure when in Australia. It is a sight not to be missed. 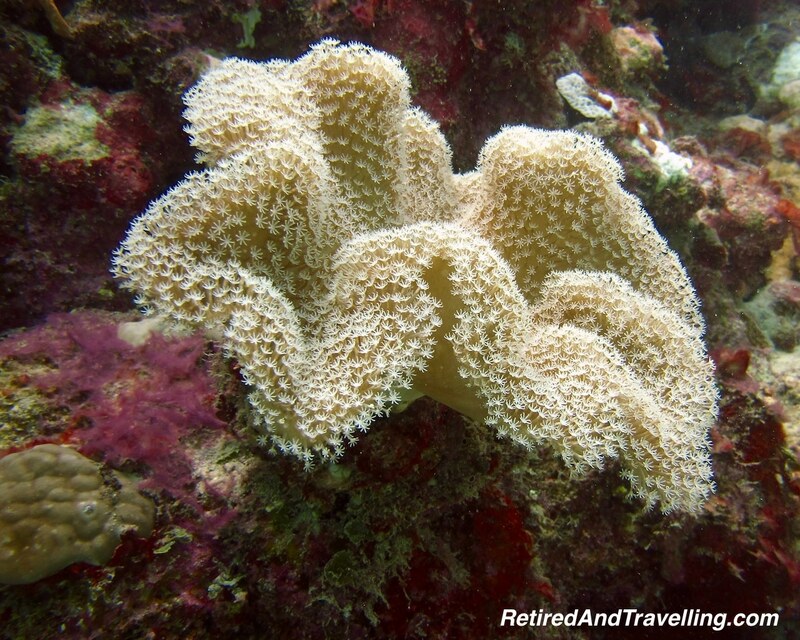 We will plan for a longer scuba diving adventure when we return – and hope that the coral bleaching currently happening due to high water temperatures doesn’t destroy too much of this treasure. 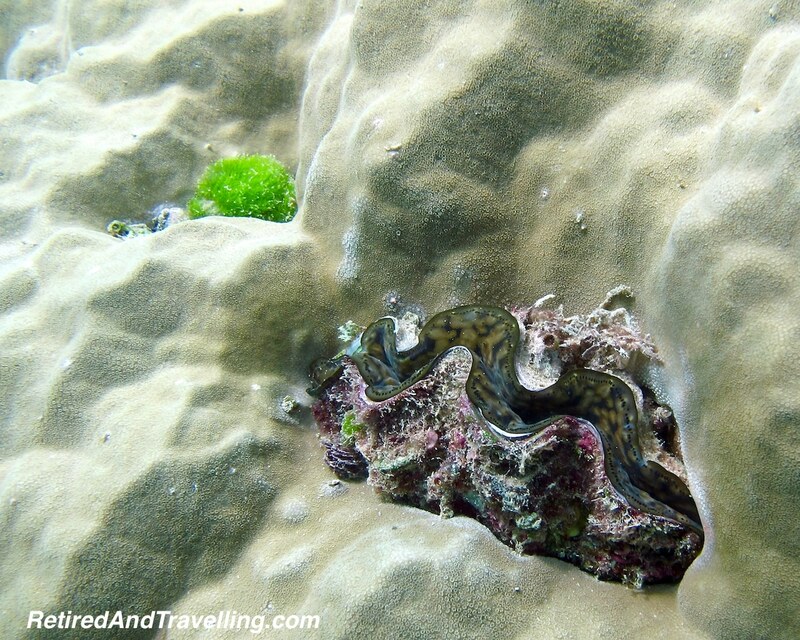 We were headed to Bali next and would end our SE Asia trip with a few weeks in Thailand. 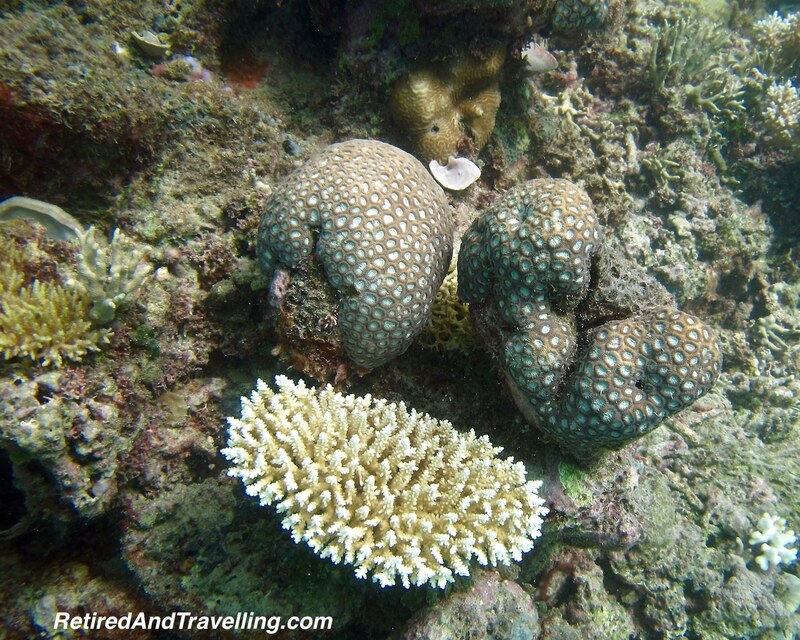 We hoped to do much more snorkelling and scuba diving, but we suspected that the GBR experience could not be topped! 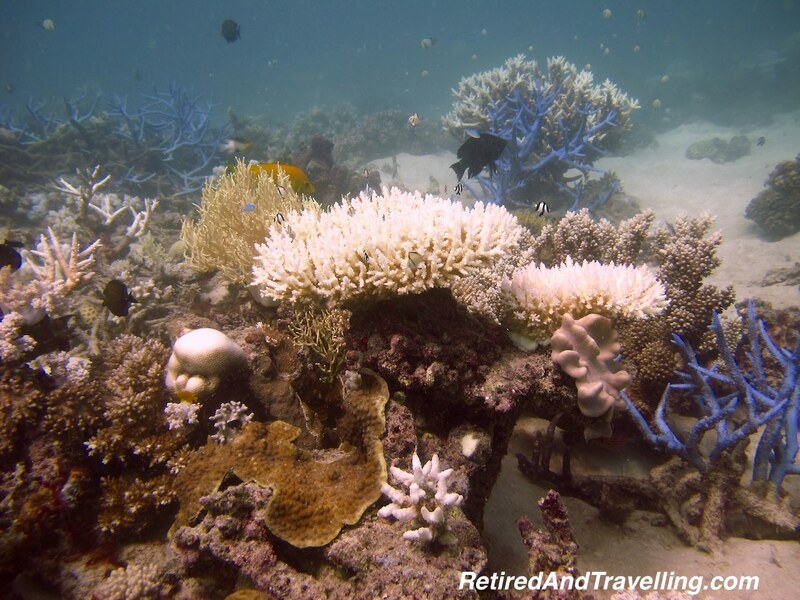 Did you snorkel or scuba the Great Barrier Reef? 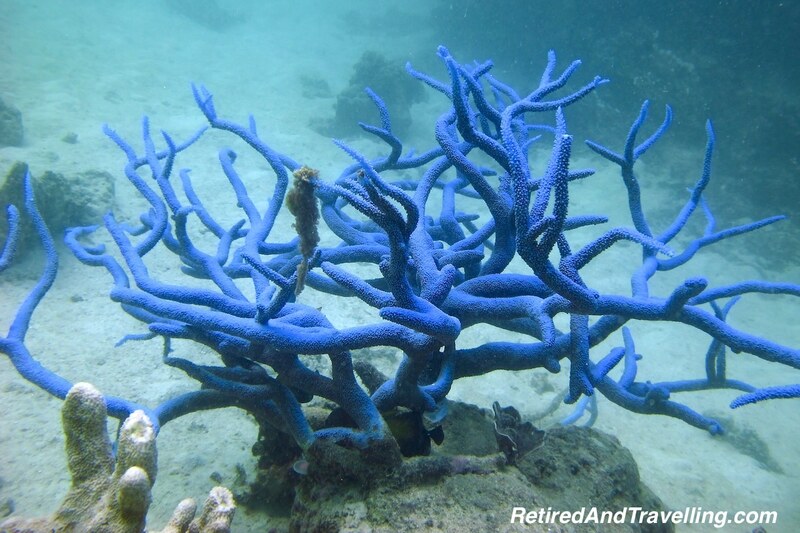 What part of the reef did you visit? Any tips for visitors? This is fabulous! 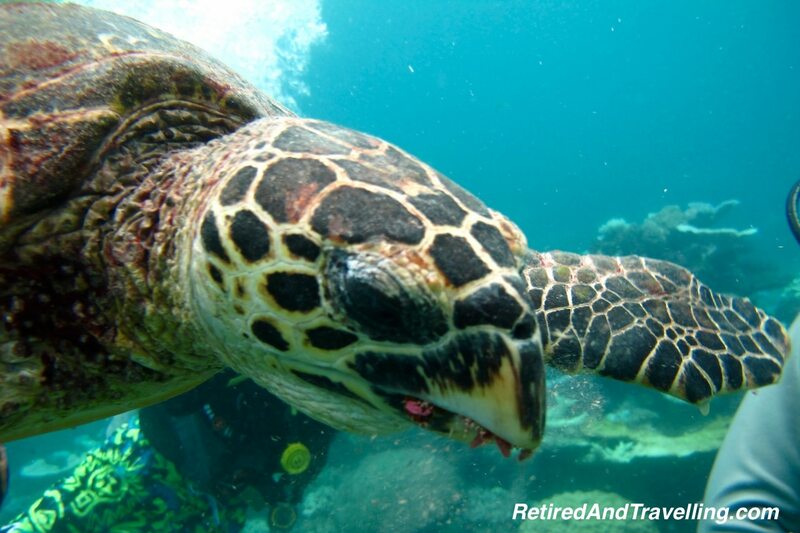 My fiancee and I are headed to GBR in early May and we’re debating the pros and cons of snorkel vs. scuba. This article was so helpful! Thank you! 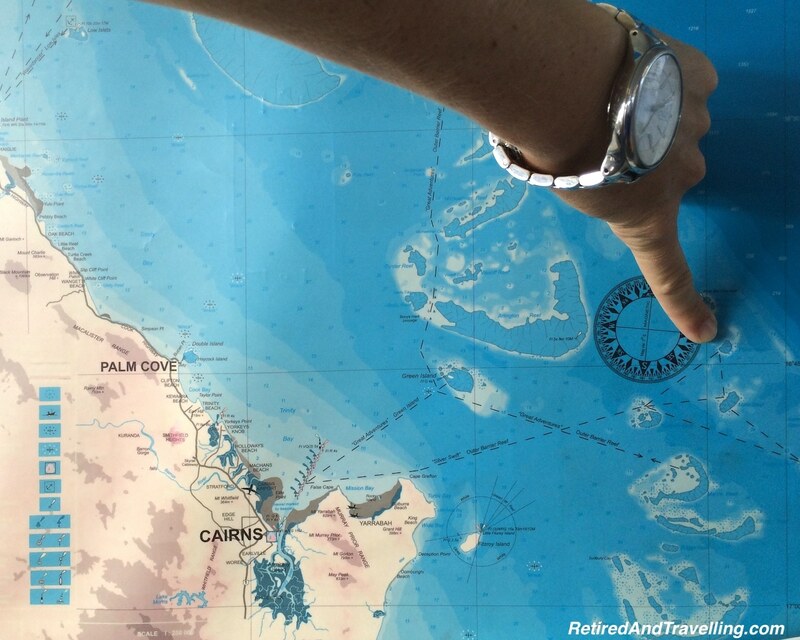 Your pics and travels look amazing!